For many years I worked for a wonderful publishing company called Houghton Mifflin Harcourt. I was lucky enough to get some great cookbooks and children’s books when I worked there, and to this day I still have a lot of them. I was fortunate to have a children’s book called Bee-bim Bop! by Linda Sue Park come across my desk. I brought it home and it quickly became one of my sons’ favorite books. It was on constant repeat at night when I used to read to them at bedtime. It’s the story of a little girl helping her mother prepare the Korean dish, bibimbap, and it has the best rhyming text. My sons, Jack and Will, loved the book and all three of us would read along together their favorite part, “Hungry, hungry, hungry for some bee-beeeem-BOP!” That’s exactly how we would pronounce it and we always had to say it with a lot of enthusiasm. 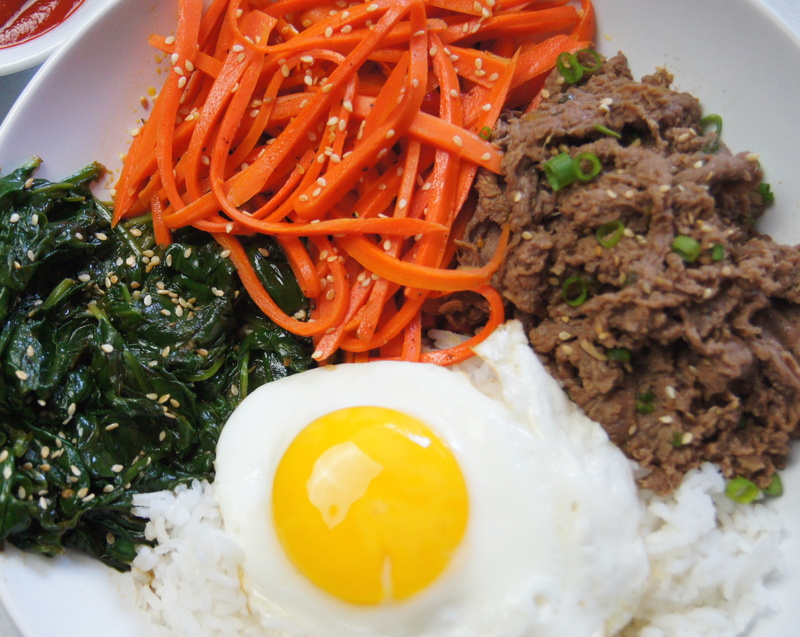 There was even a recipe for bibimbap at the end of the book and almost every night either Jack or Will would ask, “Can we make bibimbap?” My answer was always yes, and it was always followed with, “When? Tomorrow?” With all best intentions, I wanted to make bibimbap with them the next day – or even on the weekend. It’s hard to say no to a 2 year old and 5 year old, especially when they’re super cute. They’re still super cute – just now super tall – and 11 and 14. But I promised them and even though my promise is a few years late, I finally made bibimbap for them! When they came home from school and tried it they absolutely loved it. So it was totally worth the wait. The bulgogi, which is the shredded beef part of the bowl, was so flavorful and tasted so much like the bulgogi when we go out to eat at one of our favorite Japanese/Korean restaurants. The only thing missing though was the lychee martini I would usually order with it. 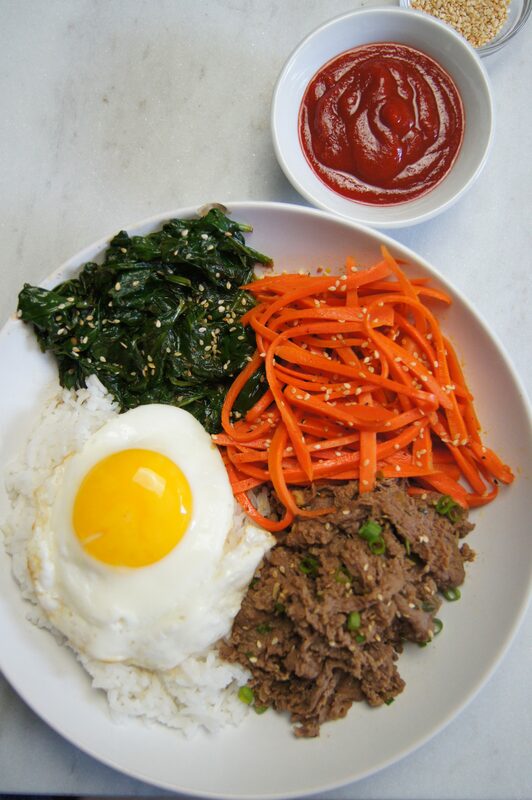 The Bibimbap Bowl is great for meal prep and for preparing in advance. 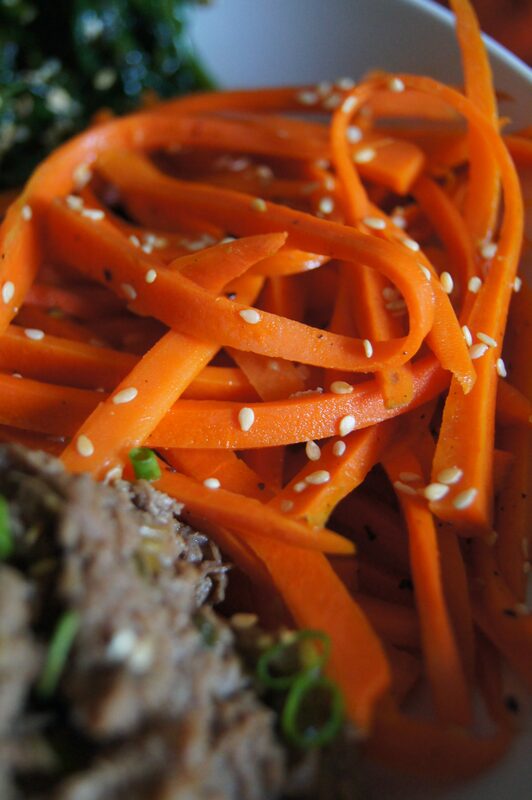 The Sesame Spinach and Sesame Carrots can be made ahead of time, while the Bulgogi marinates. 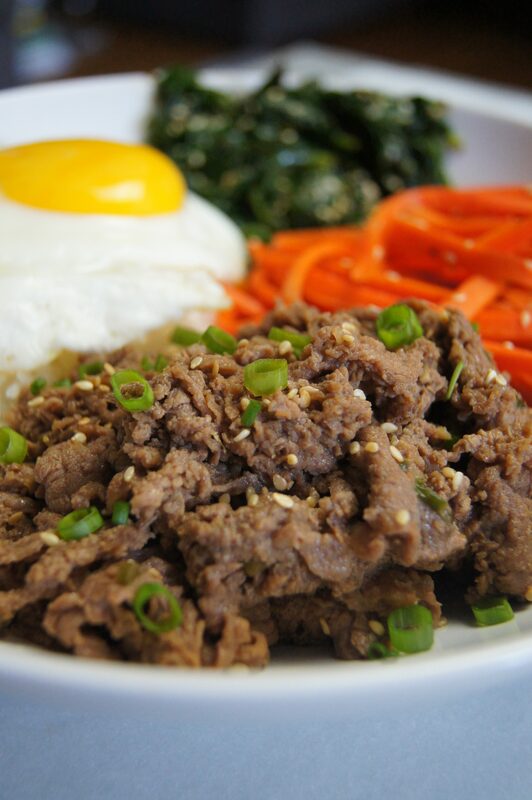 When you’re ready to cook the Bulgogi, it takes less than 10 minutes to cook and just a couple of minutes to assemble. You may even have time to make yourself a lychee martini. Just like reading Bee-bim Bop! was on heavy rotation at bedtime, this recipe will be on repeat at our house. And for the next time, I can’t wait for Jack and Will to make it with me. Whisk all ingredients, except the beef, in a medium bowl. Add beef; toss to coat. Cover; chill for 30 minutes or up to 3 hours. Heat 2 Tablespoons sesame oil in a large skillet, preferable nonstick, over medium. Once hot, add the garlic and saute for about 30 seconds, or until fragrant. Add spinach, stirring occasionally until it’s wilted. Stir in coconut sugar or granulated sugar, and soy sauce or tamari or coconut aminos. Add salt to taste. Drizzle with sesame oil to taste (about ½ tsp) and toasted sesame seeds. Can be served warm or at room temperature. Heat 1 Tablespoon in a large skillet, preferably nonstick, over medium heat (you can use the same skillet that you made the sesame spinach in). Add carrots and cook, stirring occasionally, until just tender, 3-4 minutes. Season with salt and pepper, and toasted sesame seeds. Can be served warm or at room temperature.